We are happy to help you with your house foundation, driveway, patio, or other projects. We are the folks who produce and deliver the concrete – our customers are the ones who place it and finish it to create the final product. 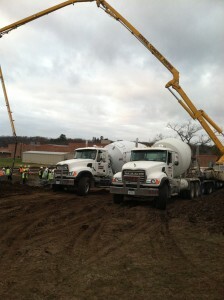 If you would like help ordering concrete and getting the project done, we can offer names and numbers of contractors who specialize in the type of work. You can call or e-mail us at the numbers below.